A lot has happened—deaths and illnesses in the family, career struggles, personal conflict. It’s been a wicked year for my psyche. Back in September, I was on the verge of leaving ADF. I had no energy for spiritual pursuits, I’d had two separate upsetting encounters with individuals in ADF, one of whom I’ve had a turbulent relationship with for a long time, and, simply put, the conflict had begun to outweigh the fulfillment I was getting. But instead of rage-quitting, I took a deep breath and told myself I would take a break until December: three whole months off would, I hoped, help me reboot mentally and spiritually. I put my ogham and tarot cards away, I dusted my altar but didn’t use it, and I tucked all of my druidry books back onto their shelves. This was actually a long time coming. My time running SDF and the subsequent vacuum it left behind started me on a long, slow burn-out. At Summerland in August, I discussed with a priest-friend the possibility of giving myself some time off from my studies, and she agreed that a break might be in my best interest. I’m coming out the other side of my personal wasteland now, and I’m not entirely sure where to go. Do I still want to be an ADF priest? What do I have to offer my community? What should be my role in my local and national pagan organizations? Do I owe it to myself to get my home practice back in order before I even consider the former questions? The answer to the last question, of course, is YES. Spiritual work should always, ALWAYS begin in the hearth and heart. But outside influences can and do affect one’s altar practice. I’ve suffered because of my fellow druids, and that hurt doesn’t just go away. I have felt, and do feel, very alone and disconnected from my local grove. Those bridges can likely be repaired, but I suspect I need to repair the foundations of my personal druidry before I even try to look outward. I’m posting today because I think sometimes it’s good to write publicly about our struggles on this path, as well as our successes. Crises of faith come to all religious folk, and druids are not exempt from that. I don’t want to walk away from ADF, and I don’t think I will. My instincts remain druidic—the question, though, is how I will act on those instincts, and what my role will be moving forward. I hope to continue posting here occasionally as I start working to figure that out. So please, forgive my absence, and light a candle to help guide me. I’m helping to organize a summer solstice chat for ADF’s Gael Kin later this week, and in preparation for our discussion, I’ve been doing some research on what summer solstice celebrations might look like for a Gaelic hearth. As I was typing up my lists of deities, practices, and ideas for workings, it occurred to me that this information might be useful to others. Up front, I’m going to say that I won’t be citing all my sources for this initial draft of this post, mostly because I’m just rounding up my notes. Eventually I’d like to turn this into a more scholarly essay, but for the moment, please accept a few statements of general knowledge without citation. We know that the solstice wasn’t a big part of Celtic celebration: quarter days, as we call them now, belong to a more modern tradition of pagan worship that collects all eight High Days. Because of this, and a distinct lack of clear solar deities in the Gaelic pantheons, it can be difficult to decide how we should celebrate the summer solstice. There are, however, a few traditions that merit exploration, and some deities whose connections to the sun and summer make them appropriate guests of honor at a solstice rite. Let’s look at deities first. Manannán mac Lir: My personal patron, and my favorite deity to honor at the summer solstice. There’s a Manx tradition of throwing fresh grasses into the sea at the summer solstice as a way of paying rent for the year (Ellison 179). Myth also says that Manannán outfitted Lugh with his boat, horse, and sword (Green 139), which does seem to lend some weight to the notion of Manannán as a deity presiding over the precursor holiday to Lughnasadh. Aine: Her name always comes up, and she is one for whom I don’t have a primary source. According to Mara Freeman, Aine “may have been a goddess of the sun, for her funeral was said to be at midsummer, the date that marks the decline of the sun’s power” (171-172). She also has faerie associations that may work well with midsummer traditions. Oengus: Born on a “day” the sun stood still (for nine months! ), Oengus is a god of love and passion. If the story of the deception around his conception by the Daghda and Boann isn’t romantic enough, he’s also mythologically associated with his own passion and that of others (Green 165). While his sun association is primarily to do with the day of his conception and his parents’ trickery, long summer nights seem as good a time as any to celebrate love and passion. Ériu: An earth mother goddess associated with the land of Ireland,Ériu also has sun associations: “the sun was perceived as a golden cup filled with red wine which Ériu, as goddess of the land, hands to successive mortal kings of Ireland, to signify their marriage and the fertility of the country” (Green 92). So that’s four deities, two male and two female, we can potentially honor at the summer solstice. Their associations with this high day may take some logical yoga to reach, but when you don’t have a recorded tradition to emulate, you take what works for you! How about traditions, though? We have our deities we want to honor, but how can we celebrate this high day at our altar and on our hearth? Manannán-Related Workings: I mentioned the tradition of paying Manannán his rent. In the past, I’ve made straw bundles and floated them down the stream near my house. This year, I’m toying with the idea of asking Manannán to bless my “boat, horse, and sword,” in some symbolic fashion: perhaps my car, pets, and pens? There may be nothing there, but it’s something I’d like to explore. Bonfires: There may or may not be a strong bonfire tradition associated with the summer solstice. Skip Ellison writes, “Records going back to the sixteenth century refer to the number of bonfires seen on hills throughout the British Isles,” continuing to say that people jumped through the fires for luck and took home the ashes for ensuring a bountiful harvest (178). However, most neopagans I know celebrate with bonfires at Beltane, not the summer solstice. But when in doubt, I suppose, light a big fire. Faerie and/or Nature Magic: Aine seems to be associated with the fairies. Since I don’t have a source for this, though, I don’t want to plunge into that mire without other reasoning. That said, midsummer is a time when we see nature and its spirits at their peak. Animals are everywhere, plants are growing, the nature spirits are flourishing. If you don’t have a strong connection to a faerie tradition or mythos, consider dedicating this high day to a celebration of the nature spirits. Sovereignty Celebrations: Irish mythology loves its sovereignty celebrations. Maybe you celebrate the sovereignty of the land at Samhain or the harvest, but consider recreating Ériu’s blessing of the king’s union with the land. A cup of water could receive the sun’s blessing, symbolizing the process of crop fertilization and growth. Or you could dedicate yourself to YOUR land, whether that’s your property or your country or even the earth. And there you have it: choose a combination of these deities and working ideas, and see what you can come up with. For high days like this one, it’s important both to be informed by our ancestors’ practices and also to be creative enough to come up with our own. Traditions have to start somewhere, you know. Ellison, Robert Lee (Skip). The Solitary Druid. New York: Citadel Press, 2005. Print. Freeman, Mara. Kindling the Celtic Spirit. New York: HarperOne, 2001. Print. Green, Miranda J. Dictionary of Celtic Myth and Legend. London: Thames & Hudson, 1992. Print. It’s a fascinating read, and quite inspiring, but that is, in part, because I can’t agree with everything the author says. I don’t strictly disagree: much of what she says seems like it could, or even should, be true, but it doesn’t hold true for me and my life as it is right now. It is thought-provoking, however, and that’s as inspiring to me as anything with which I can strongly agree or identify. If you’ve read this blog for long, you’ll know that practical paganism is something that matters to me a great deal and is something I struggle with pretty regularly. How can I integrate trancework and devotional practice into my daily life? How can magic and prayer fit into my mundane routine? In what practical ways can I manifest my devotion? It’s something I still struggle with, because I’m not honestly sure. I’m not great with trance—in fact, I can say with some certainty that trancework will be what holds me back in my path to priesthood. I have difficulty integrating magic and devotional with my mundane life, often because the notion of sacred time and sacred space as separate and Other inhibits me from seeing the sacred in my everyday activities. As I said, I don’t disagree. But this dichotomy is extremely unhelpful to me personally, because it suggests that my mundane ties are holding me back from spiritual elevation or fulfillment. I’m not saying that this is the author’s argument; indeed, I suspect she would challenge my wording and the generalization I’ve made. However, I find that the type of comparison contained in this essay acts as an unnecessary boundary to the pursuit of spiritual work in tandem with success (however one perceives it) in daily life. I spend a lot of my professional life telling myself and other writers that comparison between oneself and one’s colleagues or peers is probably the most counterproductive activity we can engage in, the very antithesis of creativity. When we compare ourselves to others, we set ourselves up for failure. There is absolutely no way I can be anyone but me, and expecting myself to work or behave like someone else is guaranteeing that I won’t meet my own expectations. It’s an impossible, ever-shifting standard. This is maybe my issue, but the suggestion that my daily life and worldly ties prevent me from achieving true connection to the divine makes me feel inadequate and destined for failure. Why should I even try, if I can’t do it in a way that works for me and with my life? I know I’m making this more black and white than it should be. However, the bright line separation between Divine and Mundane (or Profane, if you prefer) sets a standard I feel I can never achieve. I want my daily life to support my spiritual life, but I also want my spiritual life to support my daily life. And, to be honest, I would like to overcome that distinction altogether. My priority, in pursuing priesthood, has always been to be there for pagans in their daily lives: to provide spiritual support at high points (marriages and sainings) and low points (funerals and and other farewells), to create liturgical and devotional resources for depression and anxiety, to encourage spiritual activity during even the most mundane of things, like cooking and cleaning. I would absolutely fall into this author’s camp of the priest with a foot in each world. But when there’s a divide between true mysticism and practical paganism, I feel stymied before I even begin. If it’s a lower calling, to integrate spiritual practice into daily life, what am I aiming for? If true unification is impossible, why am I even trying? If it’s so difficult to achieve mysticism that one has to sever ties with this world, is there any point at all to my pursuit of practical paganism? Maybe we do need dedicated mystics who don’t share my insecurities and doubts. For most of us, however, I think bringing the sacred into our routine is a grand aspiration because it’s a way of making the sacred real. When I honor the spirits as I take my daily walk (for exercise, mind you, not contemplation), that is finding sacred space in this world. When I honor Brighid as I clean my stove, that is a way of welcoming her into my daily life. And those activities are what matter to me. Overcoming that distinction is one of my ultimate goals for my path, and I hope it’s not one that’s counterproductive to the mainstream pagan way of thought (if such a thing exists). The concept of sacred space/time is important, I think, particularly for liturgy and group ritual, but it also makes it difficult to connect one’s spiritual life with one’s daily life. And if I can’t have some sort of integration, I think I will find the standards of devotion required by the path of priesthood extraordinarily different. Maybe solitary mysticism is a high goal to achieve. But for me, the ultimate end will be honoring the spirits with my mundane life, to the best of my ability. I want to transcend the divide between sacred and mundane and live, truly, in both worlds at once, with no distinction between my steps on either path. Well, I planned to make May a month of druid boot camp, with nightly devotionals and near-nightly attention to my studies. I did well for the first ten days or so—and then I got sick, and not just with the sniffles. I was well and truly sick, with a high fever and wracking cough and a complete inability to get out of bed for more than a few minutes at a time. I’m proud to say that in two weeks of illness, I only missed four nights of devotional, and I updated my journal at least three times a week. I, and my practice, survived together. I realized, though, that while periods of intensive study are excellent, and often invigorating, they’re not what I really need. What I need is a druidry, a nightly practice, that wears well in washing, that sustains me when I’m sick, and upholds me when I’m at my worst. I need room for success, certainly, but I also need room for failure and fevers and fumbled offerings. I need a lifestyle, not a practice—though practice enriches that lifestyle, without a doubt. I’ll be trying my boot camp plan again in June. Even my truncated period of intensive work started to build some good habits, so I know that element of the plan will be successful. Ad while I know I’ll have some screw-ups, that I’ll fall asleep before completing devotionals, that I’ll occasionally forget offerings or have a candle that just won’t stay lit, I also know that my efforts, successful or faltering, will deepen my connection to the Kindred. Well, I’m a day late and a dollar short (four days, really, and let’s not get into the money), but here’s a poem I composed for Beltane. This is actually a rough draft of a poem I’m submitting for my clergy training, and it doesn’t scan, so don’t judge me too harshly. I do prose, not poetry. Fires of Beltane, shine brightly through the night! Feel the promise of the sheltering light! Even the wise fall victim to the fey. For strength and aid, to the Kindred we pray. Now shielding fires may help us find the way. In darkness, the need fires will shine bright. Keep close, and soon the summer shall hold sway. Well, well, it’s been awhile, hasn’t it? This has been a difficult year. I’ve had some career set-backs and changes that led to starting a new job with more strenuous hours. My husband and I moved. My extended family has faced sudden loss. Things have changed, and not all for the better. It’s been Life, I suppose, with that all-important capital L that stands for all the little things we deal with day by day and never mention. I made a deliberate choice to blog less here. Part of that change happened when I took over SDF, but more of it happened before then. I realized that the constant self-analysis was making my practice too meta—when I was doing a thing, I was thinking about writing about doing the thing, and that was taking away from my experience of actually doing the thing itself. I cut back on blogging because I wanted to focus more on the moment of my practice. Now, two years later, I’ve found that without that constant consideration and reflection, I’ve fallen into a druidic rut. My rituals feel the same. My devotionals, day by day, never change. The seasons shift around me, but I plug along, saying the same words and thinking the same things. I’ve lost the freshness and sense of adventure I had when I started, and my ability to experiment and question myself has stagnated. This blog and the ADFers I met through it were my first community. This digital space witnessed my early, breathless successes and my cheerful, clumsy failures. Here I explored what it meant to me to be a druid, and I questioned the world around me through the posts I wrote here. I want to recapture that particular magic. Ironically, given that I started as such a prolific blogger, journaling has proven to be my biggest obstacle to my clergy training work. I cannot make myself journal my practice every week. I’ve tried Google calendar reminders, I’ve tried Habit RPG, I’ve even tried siccing my husband’s nagging powers on me. None of it has worked. So the first part of the challenge will be, for one month (or possibly the span between two High Days), I will blog here every week and write in my private journal every day. The second part of the challenge will be a self-directed druidic bootcamp, in which I practice trance twice a week and work on CTP essays twice a week. It would (will?) be a challenge. I haven’t decided for sure if I’m going to do it. But Beltane is approaching, and I know I want to make a change. It seems as good a date to start as any other. I know I can do this, but I have to hold myself accountable to documenting my work. What do you think, readers? Want to help me? Can you think of a better way to rope myself into keeping up with my liturgy and trance journals? I’m not much of one for spells. I don’t really think of myself as a ‘witch,’ or a practitioner of magic. Most of my spells are ritual workings, meant to honor the changing of the seasons in some way, a method of honoring the deities on the High Days. Occasionally, though, I get crafty and branch out. Nearly two years ago, a friend and I decided to get together at our local co-op, which serves not only as a grocery store, but also as a coffee shop, cafe, and hang-out for like-minded folks. We were both interested in magical crafts, and we decided to try our hand at making witch bottles*. At the time, I was stuck on a book and in a professional rut, so I opted to make a bottle designed to clear myself of stagnant energies and to increase creativity. A month later, I wrote a new book in a fever of inspiration, one that stands out still as some of my best work. Did the spell itself make a difference? I’m not sure. Regardless, the MAKING of the bottle hoped to focus me, and having the prettily decorated bottle nearby in my creative space helped to remind me what I wanted to accomplish. Whether you believe in the power of the spell itself or the symbolic, focusing power of the spell’s making, it’s a useful tool, one that ought not be dismissed. 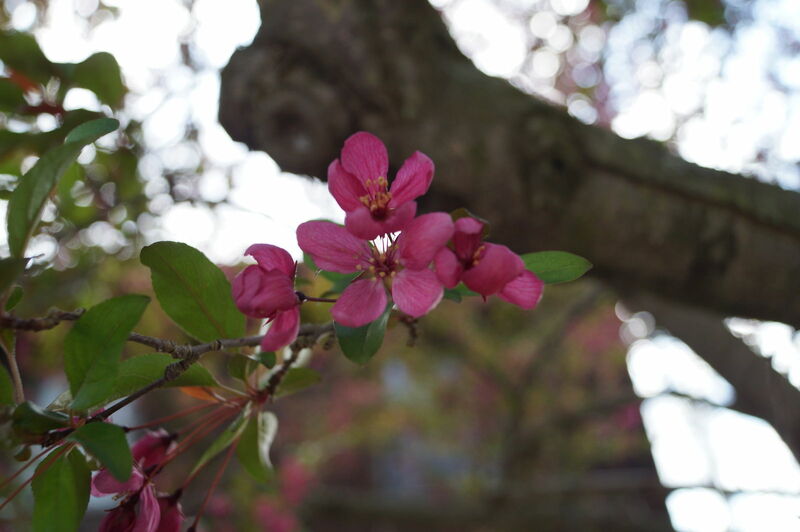 “‘Clean Up’ Creativity Mix”: This mix is intended to soothe one during and draw one through a period of professional and/or creative struggle; to boost recovery of mental stability and creativity, it’s meant to help one regain one’s creative confidence. attractive, clean, clear glass bottle, commonly available at craft stores; an empty jam jar will work just as well! Drop the following mix into a bottle in attractive layers; keep in mind that smaller spices, such as finely ground herbs like basil and orange peel, will sink to the bottom, as will heavier items such as crystals. Larger, lighter items like chopped cinnamon and dried beans will hold their place and “float” atop smaller or more dense layers. 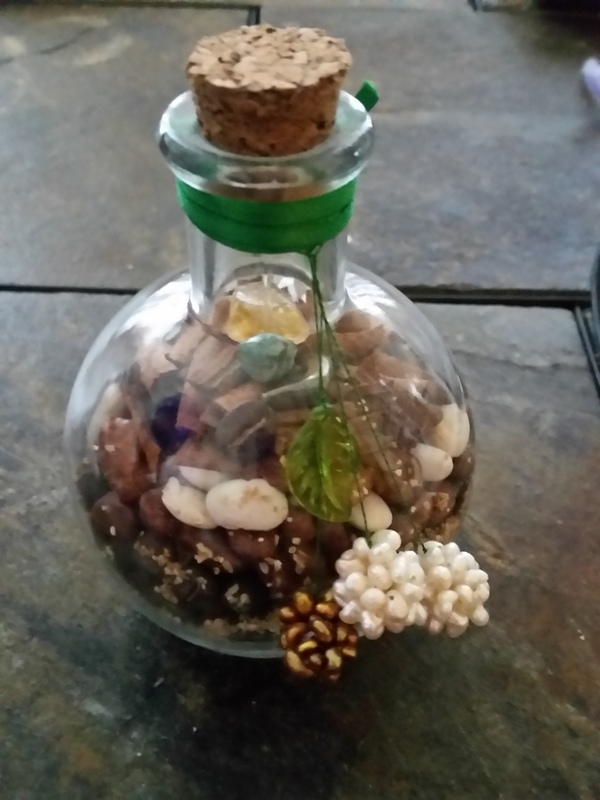 Once you’ve filled your bottle, decorate it in a way that speaks to YOU of what you’re trying to accomplish; in my case, green ribbon and green leaf beads spoke of prosperity and fertility, while pearl beads reminded me of the triumph of creativity through difficulty. Place the bottle in an area you’ll see it while you’re working. Because the mix is a fragrant one, don’t hesitate to handle the bottle and smell the herbal mixture: it may just give you the energizing, creative spark you need! Finally, while I’ve provided resources I’ve used, don’t hesitate to refer to books and authors whose works speak to you. Indeed, be sure to use your own instincts and creativity when creating such a spell; since you absolutely are not consuming what you make, you may get creative with ingredients. This spell is for display only, and you can use the items that speak to you of your own needs. Bradley, Kris. Mrs. B’s Guide to Household Witchery: Everyday Magic, Spells, and Recipes. San Francisco: Weiser Books, 2012. Print. Cunningham, Scott. Encyclopedia of Crystal, Gem, and Metal Magic. St. Paul, Minnesota: Llewellyn Publications, 2002. Print. — Encyclopedia of Magical Herbs. Woodbury, Minnesota: Llewellyn Publications, 2010.